A typical flowering plant can be divided into two systems, viz. the root system and the shoot system. The shoot system contains stem, leaves, flowers and fruits. The following figure shows the structure of a typical flowering plant. There are three types of root system, viz. tap root system, fibrous root system and adventitious root system. Tap Root System: This type of root system is mainly present in dicotyledonous plants. Direct elongation of the radicle results in formation of primary root. The primary root bears secondary, tertiary, etc. roots. The primary root; along with its branches; makes the tap root system, e.g. mustard, banyan, etc. Fibrous Root System: This type of root system is mainly present in monocotyledonous plants. The primary root is short lived after germination. This is replaced by a large number of roots and all of them emerge from the base of the stem. Such roots constitute the fibrous root system, e.g. wheat, paddy, grass, etc. Adventitious Roots: Sometimes, roots arise from some other plant parts (other than radicle). Such roots are called adventitious roots. Adventitious roots are used for various purposes; like vegetative propagation, mechanical support, etc. Root Cap: The root is covered at the tip by a thimble like structure. 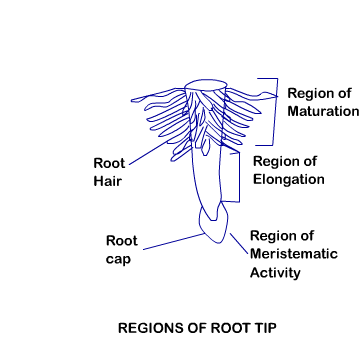 This structure is called root cap. The root cap protects the tender root apex when it makes its way through the soil. Region of Elongation: This region lies a few millimeters above the root cap. This is the region of meristematic activity. The cells in this region are very small, have thin wall and dense protoplasm. Since this the meristematic region, so the cells divide rapidly. The cells near this region undergo rapid elongation and enlargement. These cells are responsible for the growth of root in length. Region of Maturation: This region is just above the region of elongation. The cells from the region of elongation differentiate and mature, and then form the region of maturation. The root hairs come out in this region. Root hairs are part of the root epidermis. Root modification for food storage: Tap roots of turnip and carrot and adventitious roots of sweet potato are examples of modification of root for food storage. Modification for support: In banyan trees, hanging roots come out from branches. The hanging roots then go into the soil to provide additional support to the huge banyan tree. Such roots are called prop roots. In case of a maize plant, roots emerge out from the lower node of the stem and go into the ground. Such roots are called stilt roots and provide additional support. 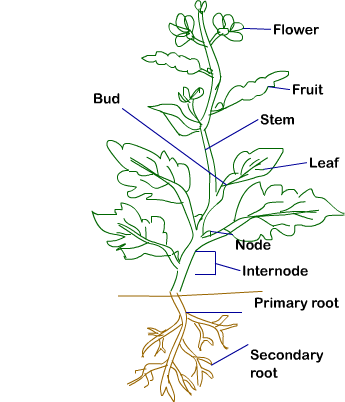 Modification for respiration: In plants which grow in swamps, many roots come out vertically above the ground. These are hollow roots and are called pneumatophores. They facilitate exchange of gases in the roots.